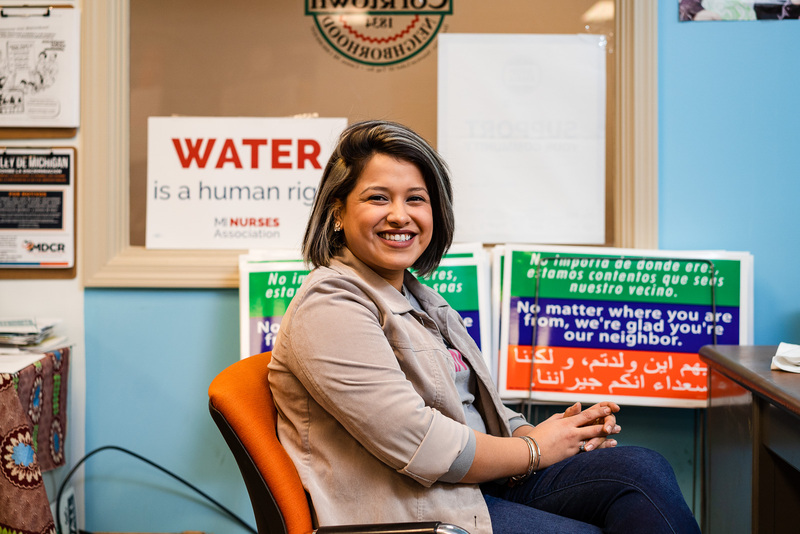 Although it’s located in one of the world’s breadbaskets, northeast Indiana is no stranger to economic downturns and industrialized food systems. But the efforts of entrepreneur, farmer, and restaurateur Pete Eshelman and his family are helping to change that. Eshelman, along with his wife, Alice Eshelman, and Pete’s brother, Tim Eshelman, founded Joseph Decuis in 2000, setting into motion a large part of northeast Indiana’s growing farm-to-fork (or farm-to-table) food scene. 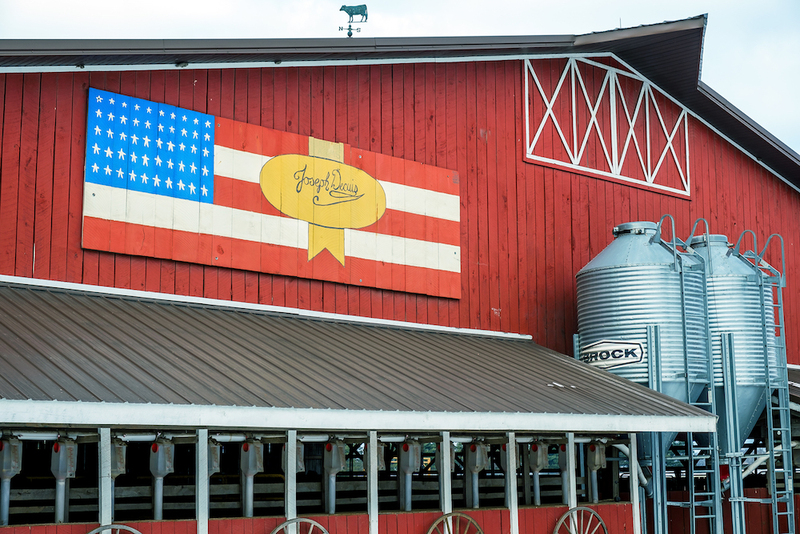 Today, their business includes a fine-dining restaurant in the charming town of Roanoke; the Emporium, a mixed-use casual eatery and retail space, also in Roanoke; and the Joseph Decuis Wagyu Farm in Columbia City, where livestock is raised and fresh food is grown. Joseph Decuis restaurant is at 191 N Main St. in Roanoke. Their work—which ranges from farming the land to feeding and educating consumers—is putting local food production in an important position to bolster northeast Indiana’s regional economy and putting the “culture” back in Indiana agriculture. But while the benefits of Joseph Decuis are far-reaching, it all happened organically, so to speak, Pete says. “Necessity is the mother of invention,” he quips. Before Pete and his family moved to Indiana, he worked in the New York Yankees front office in New York City, where he met Alice, who was an actress at the time. When he, Alice, and his brother, Tim, all moved to Indiana from the East Coast in the late 1980s, the Eshelman brothers launched a sports and entertainment insurance business (now publicly held) and wanted a way to impress their clients with excellent food. 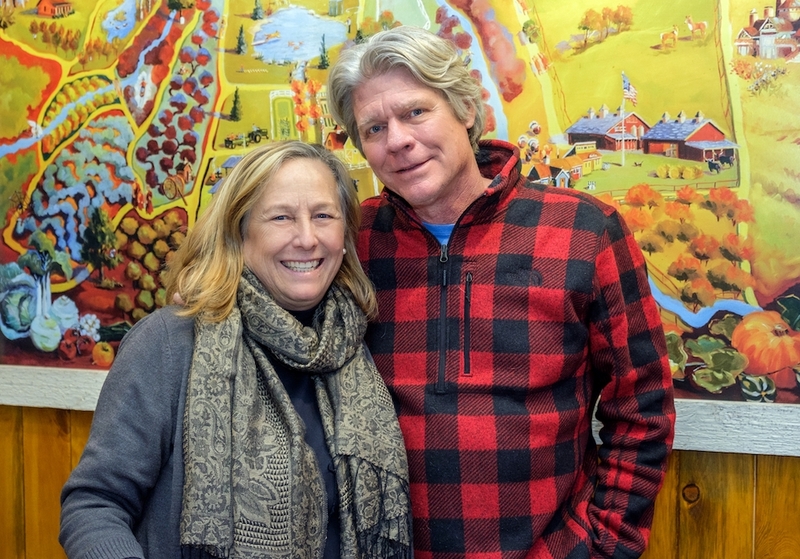 Pete and Alice originally hosted visitors at their family farm in Columbia City, where they still offer Farmstead dinners and events from time to time. They purchased an old bank building in Roanoke, converting it into a private dining facility in 1996. 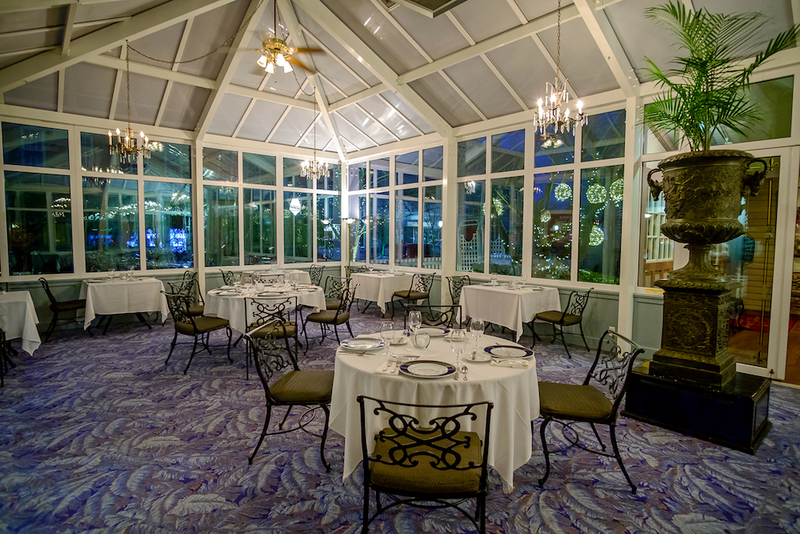 Solarium style dining at Joseph Decuis restaurant. 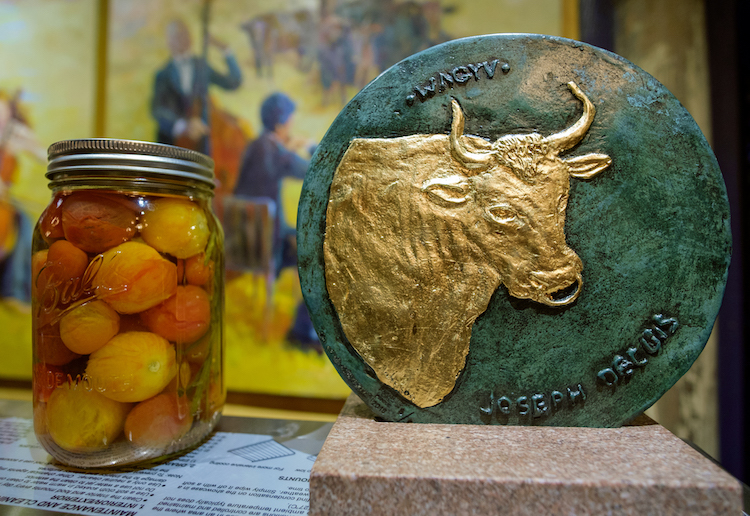 A few years later, as word spread about the Eshelman’s “great food in a bank,” they opened Joseph Decuis to the public, naming it after their Louisiana ancestor whom they credit for the family’s longstanding tradition of farm-to-fork dining experiences. In a way, it all started with a commitment to great food, Pete says. 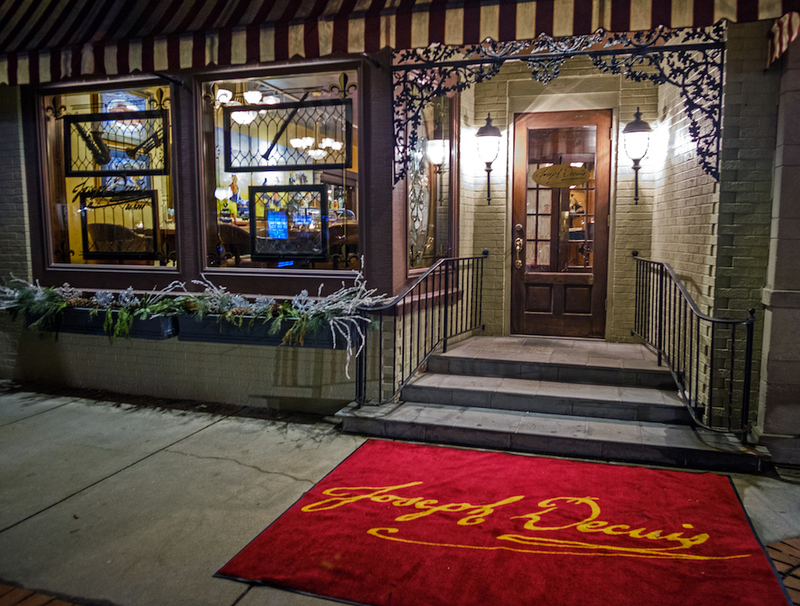 Over the years, Joseph Decuis has made a name for itself as one of Indiana's most highly awarded restaurants. 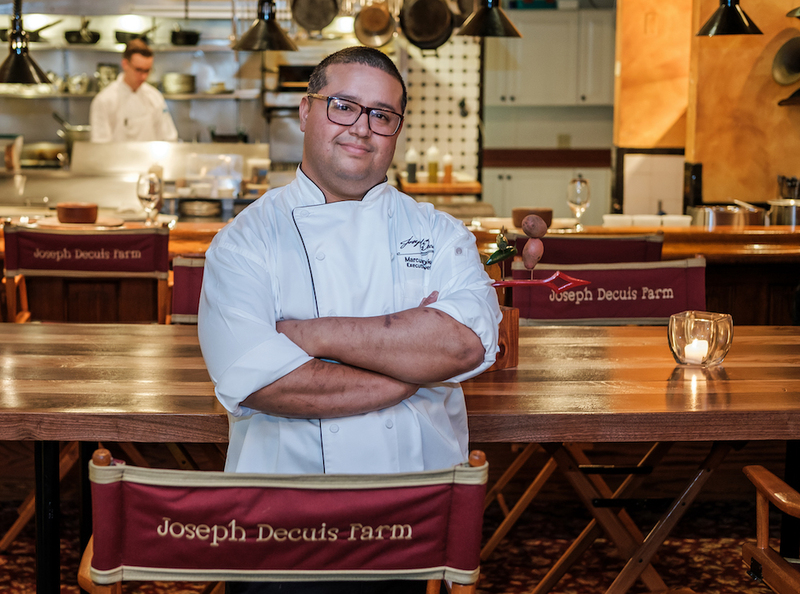 Joseph Decuis is known for its prized Wagyu beef. According to its website, it has earned the "Best of Award of Excellence" by Wine Spectator and AAA's Four Diamond Award. It has also been voted Indiana's #1 Restaurant (and one of the Top 50 in the United States) by Open Table diners. The centerpiece is its offerings is Wagyu beef, a highly prized Japanese variety. (In the Japanese language, wa means “Japanese” and gyu means “beef.”) In fact, Joseph Decuis is the only restaurant in the United States to raise its own Wagyu. 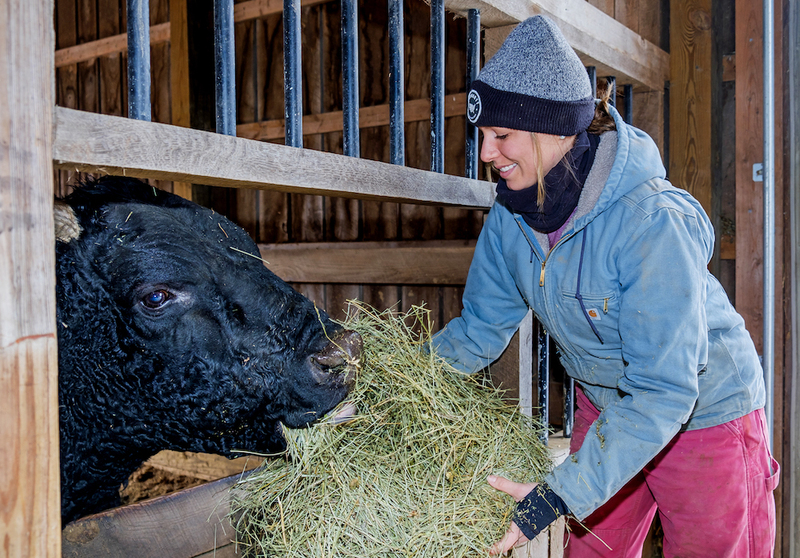 The Eshelmans's daughter, Hilary, feeds a Wagyu bull on the farm. The Eshelmans learned the specialized practice directly from Shogo Takeda, a Japanese Wagyu master. Using genetics Takeda perfected and the husbandry practices he recommends, they produce two types of beef: full-blooded Wagyu and Wagyu crossbred with Angus. Both products exceed USDA Prime grade. In addition to Wagyu cattle, the Eshelmans raise Mangalitza pigs (a Hungarian breed), and they grow a variety of vegetables and herbs, including hops to make their own beer. With few exceptions, they produce food for their customers, not for other restaurants. 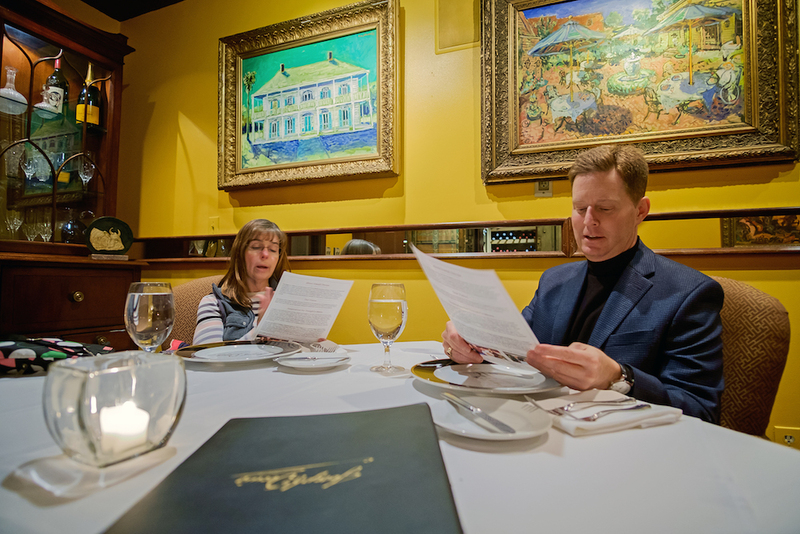 Patrons browse the menu at Joseph Decuis restaurant. Even so, the Eshelmans also know they can’t succeed without partnering with other like-minded regional farms. These partnerships exemplify what Pete believes is a growing local food scene in northeast Indiana. “There is a very rich resource of local family farms,” he says, referring to both Hawkins Family Farm and Gunthorp Farms, as well as Seven Sons Farms in Roanoke. 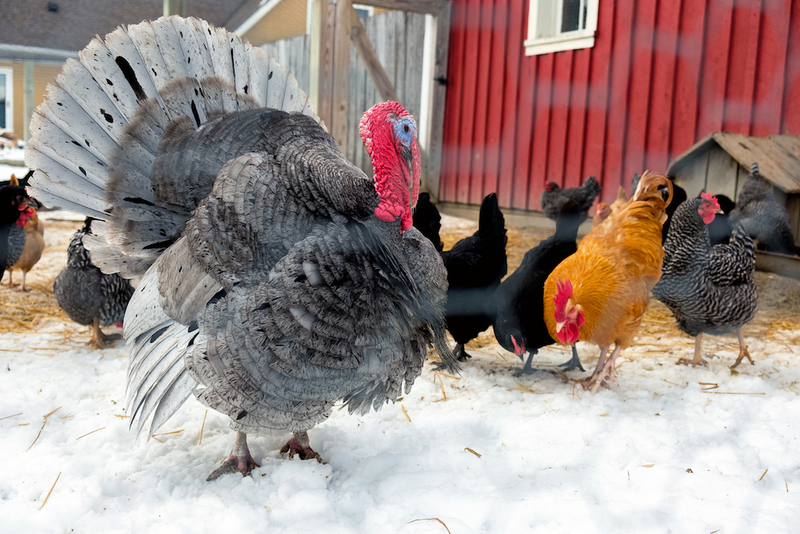 A turkey with free range chickens at Joseph Decuis farm. He says this resource, along with the restaurants and markets that serve its collective products, is providing energy for people to think about the food they eat in fresh ways, driving entrepreneurs like himself to develop solutions. 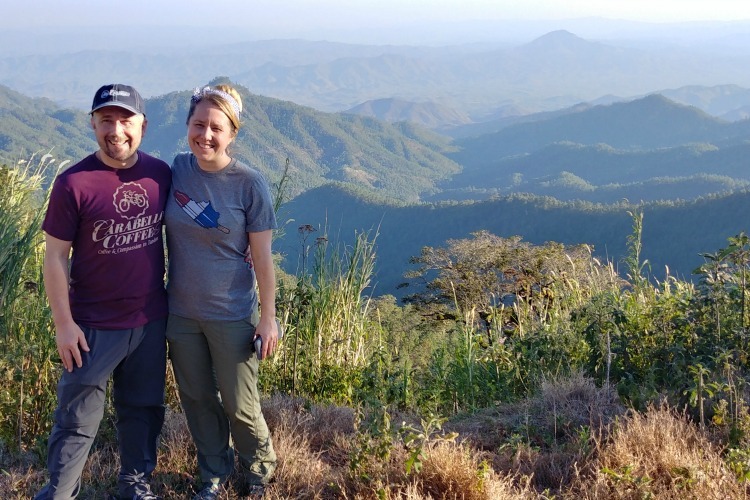 “In America, we’re such entrepreneurs, and what’s happened is that our food systems have become almost industrialized through the industrialization of food,” he says. The Joseph Decuis farm in Columbia City. In the era after World War II, the country’s large corporations grew, its franchises developed, its fast food industry boomed, and its drive for the dollar exceeded its attention to health, hurting business in local food economies. Even in a farming state like Indiana, data shows that 90 percent of the dollars consumers spend on food are going out of state or out of the country. Pete says statistics like these have been a wakeup call for Hoosiers, prompting them to ask themselves a few critical questions. 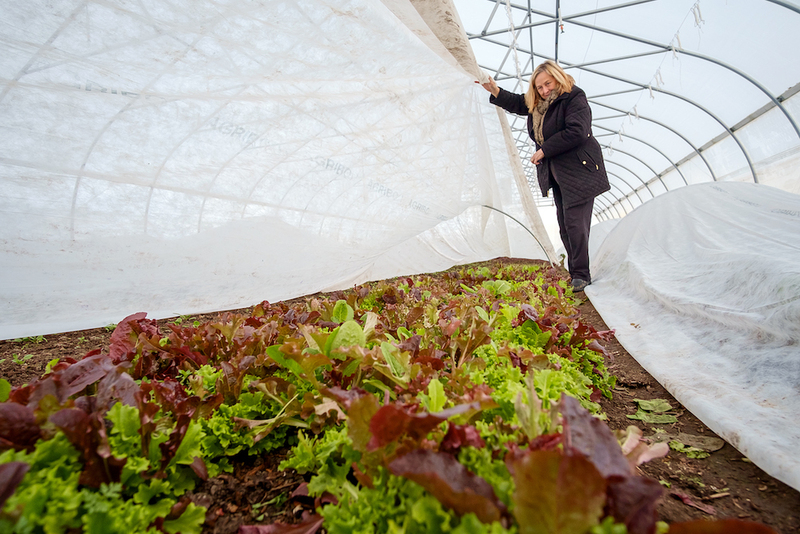 Alice uncovers leaf lettuce that is grown year-round on the farm. It’s questions like these that are inspiring entrepreneurs and farmers alike, allowing farm-to-fork and local food movements to thrive. 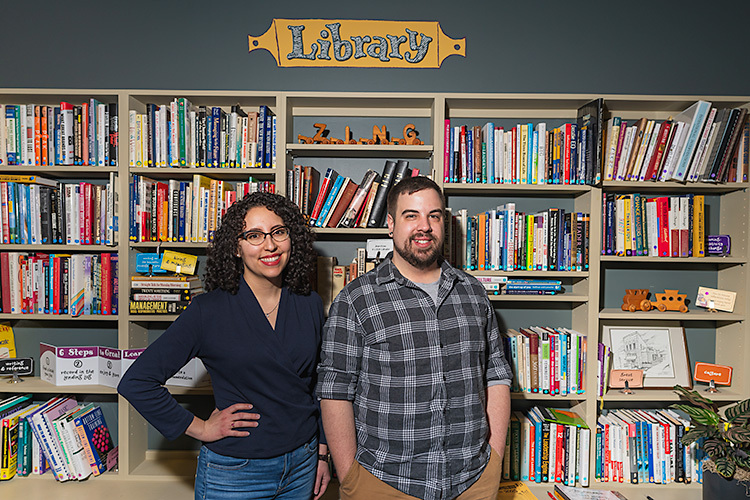 As leaders in northeast Indiana’s farm-to-fork movement, the Eshelmans’ strategy is to set the bar high, not only for Joseph Decuis, but for the entire region. 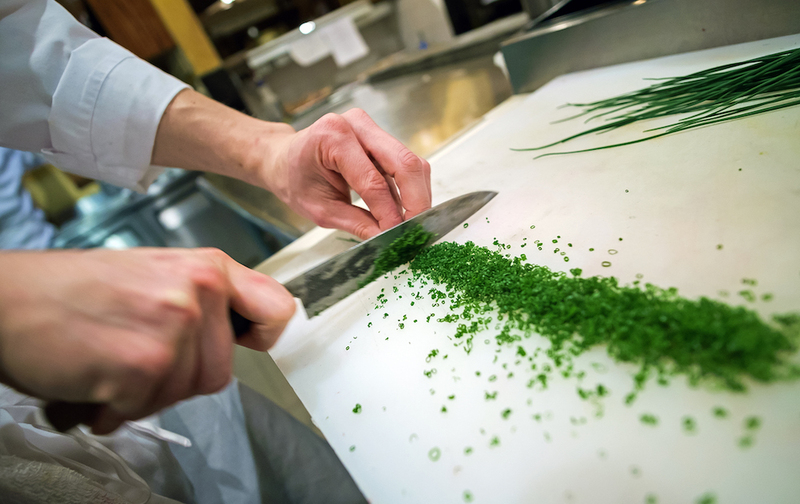 Chefs at Joseph Decuis restaurant chop chives in the kitchen. 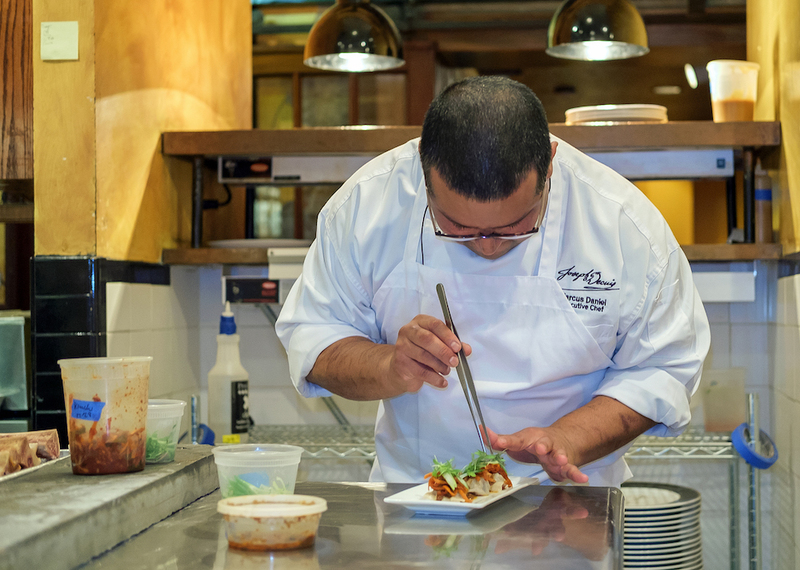 But while growing a nationally recognized food culture is a big concept, it comes down to the details. One of the main emphases at Joseph Decuis is seasonality. For example, you will never eat a “fresh” tomato or strawberry there in the middle of February, and you likely won’t find too many carrots on the menu in May or June. 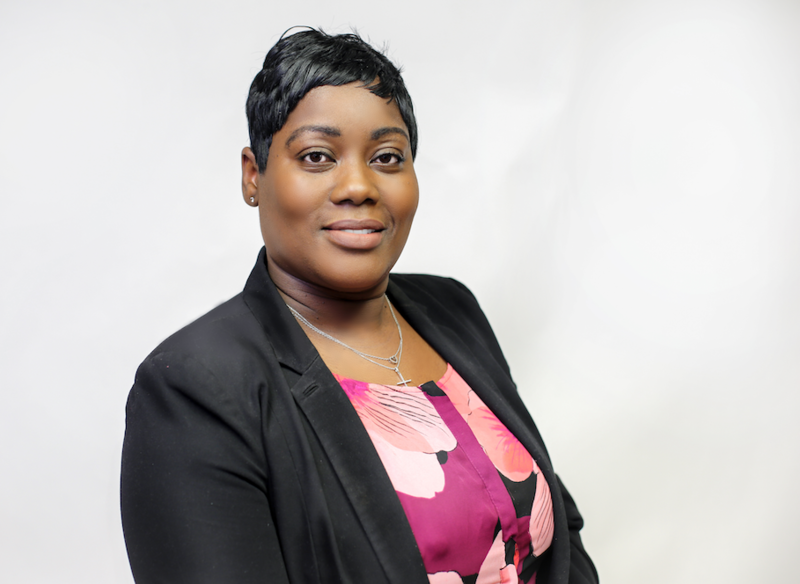 It’s this attention to seasonal timetables and commitment to excellence that helps the restaurants attract chefs nationwide, like Head Chef Marcus Daniel, who previously worked as a chef in New York City. Chef Marcus Daniel prepares a dish. Daniel also appreciates the latitude he is given to be creative at Joseph Decuis. Andrew Smith, a chef and one of the founders at Junk Ditch Brewing Company in Fort Wayne, used to be Chef de Cuisine at Joseph Decuis, an experience he credits for his professional growth. “At Joseph Decuis, I learned about seasonality and butchering Wagyu and Mangalitza,” Smith says. 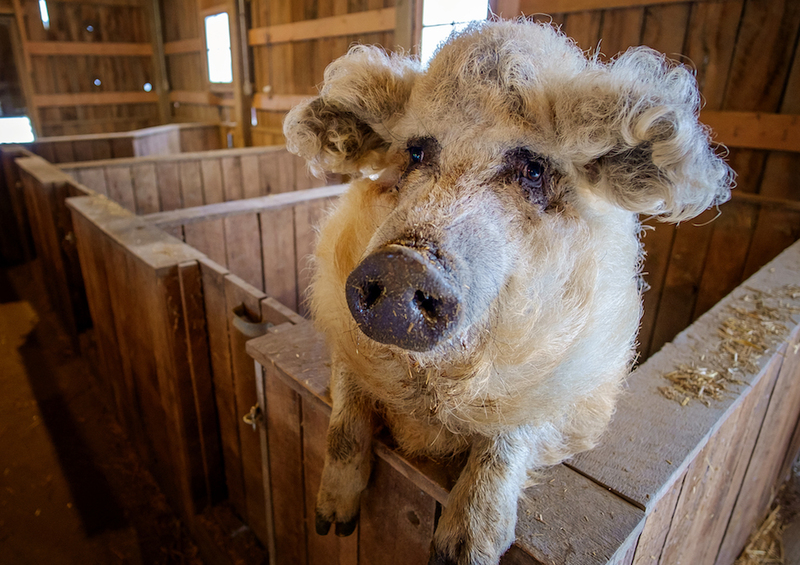 A Mangalitza sow or woolly pig at Joseph Decuis farm. He takes the same local-is-better approach now at Junk Ditch, where he personally visits the farms he sources ingredients from to ensure the quality of their products. “The key is flavor,” he adds. Other Joseph Decuis alums have also gone on to begin farm-to-fork restaurants in Fort Wayne, such as Tolon and The Golden (now closed). Pete says it’s all part of a bigger story playing out across the region. Chef Marcus Daniel at Joseph Decuis previously worked in New York. As northeast Indiana returns to its roots in local agriculture, he says food entrepreneurs have an important opportunity to shape the future of the region’s reputation. Read more articles by AJ Hughes.